Greg Burke, Vatican spokesman, said the pope was following “with affection and emotion” the events concerning Charlie Gard, a 10-month-old infant born in England with mitochondrial DNA depletion syndrome, which causes progressive muscle weakness, brain damage and respiratory or liver failure; it is typically fatal. Expressing his closeness to the parents, Pope Francis said he was “praying for them, hoping that their desire to accompany and take care of their own baby until the end is not disregarded,” Burke’s written statement said in Italian July 2. In London, Charlie’s parents, Chris Gard and Connie Yates, crowdfunded nearly $1.7 million in four months to finance having the baby treated in the United States. However, when hospital officials wanted to stop providing life support for the baby, the parents went to a London court with their case, but the court ruled the baby should be allowed to “die with dignity” and doctors could stop providing life support. Further court actions, including a decision by the European Court of Human Rights June 27, upheld the ruling. 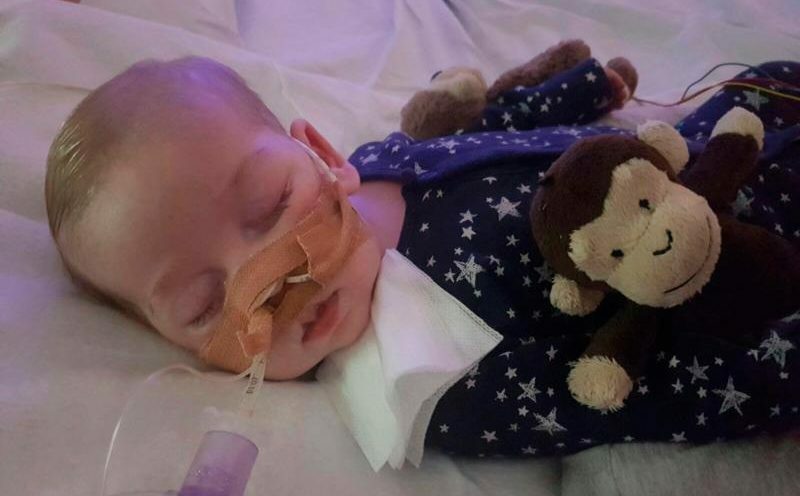 The parents’ continued request to the hospital was to allow them to take Charlie home to die. That request has been denied, and the hospital had said it would be suspending life support June 30 — a date that has since been extended. The Pontifical Academy for Life and the Bishops’ Conference of England and Wales extended prayers for Charlie, the medical staff caring for him and the parents. Archbishop Vincenzo Paglia, president of the Pontifical Academy for Life, said the situation of Charlie and his parents “has meant both pain and hope for all of us,” and he assured them of his prayers. “We feel close to him, to his mother, his father, and all those who have cared for him and struggled together with him until now,” he said in a written statement, dated June 28 and posted online by Vatican Radio June 29. If the relationship between patient, guardians and doctors is “interfered with, everything becomes more difficult, and legal action becomes a last resort,” the archbishop said. There is also the “risk of ideological or political manipulation, which is always to be avoided, or of media sensationalism, which can be sadly superficial,” he added.